Ventolin is a blue inhaler that contains the ingredient Salbutamol. It works by opening up the airways, relieving the symptoms of asthma such as breathlessness, wheeze or tight chest. It is therefore known as a "reliever". Ventolin contains the active ingredient Salbutamol. It contains 100 micrograms of Salbutamol per dose. Any other preparation that delivers 100 micrograms per dose in an inhaler form is medicinally the same as Ventolin. Some examples include Salamol and Airsalb. Whilst the inhalers may differ slightly in appearance, they all work in exactly the same way. Ventolin works by opening up the airways allowing air into the lungs. Ventolin contains the active ingredient Salbutamol. Salbutamol acts on receptors in the in the airways, known as beta 2 receptors, which cause the muscles in the airways to relax an widen. The opening of the airways by salbutamol makes it easier to breath. How long does Ventolin take to work? You should notice that your breathing is starting to improve almost immediately. After around 5-15 minutes, you should be breathing much easier. If you notice that no improvements have been made or your symptoms are getting worse, seek urgent medical attention. When should I use Ventolin? You should use Ventolin when you experience asthma symptoms such as shortness of breath and tightness of the chest. The Ventolin inhaler will work to provide almost immediate relief. it is important that you keep your inhaler with you at all times in case your asthma gets worse at some point. How do I use Ventolin? Before you use Ventolin for the first time, it is important to prime your inhaler. This will ensure that the correct amount of medicine is delivered to you when you begin to use it. Take the cap off the inhaler and shake it well. How do I clean my Ventolin inhaler? It is recommended to clean your Ventolin inhaler once a week. This stops it from jamming. 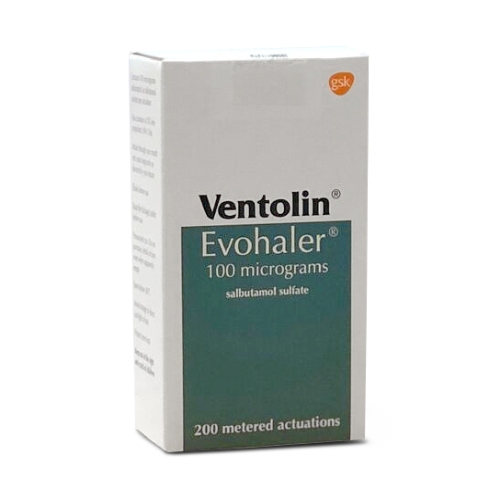 You can buy Ventolin (salbutamol) online after answering a few questions about your health. Providing it is safe to do so, we will send it out to you using a next day delivery service.